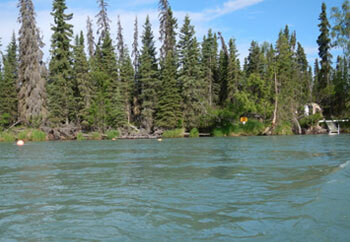 The Kenai River flows 82 miles from Kenai Lake, through Skilak Lake and into Cook Inlet. 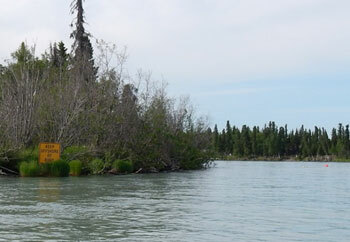 The king salmon sonar site is located approximately 14 miles upstream from the mouth of the Kenai River between Stewart’s Landing and Falling In Hole. This section of river is composed of a main channel (approximately 300 feet wide) and a minor channel (approximately 100 feet wide) that flows behind an island located on the east bank. 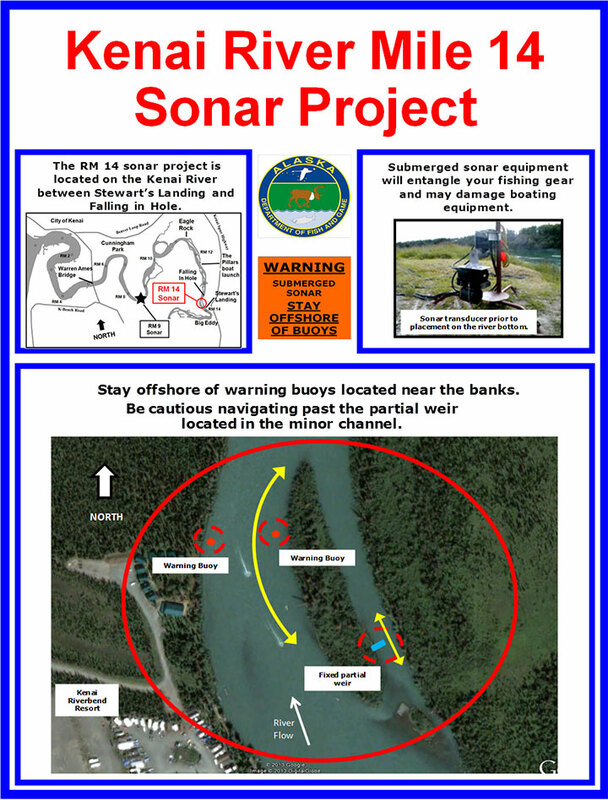 Four sonars are used to detect fish migrating up the main channel, and one sonar in combination with a fixed weir is used to cover the minor channel, providing near complete coverage of the river cross section. The site's camp—a large Weatherport tent housing data collection computers—is located along the river's west bank. From a boat in the river, the site's warning signs and marker buoys are highly visible on the main channel, as is the weir on the minor channel. 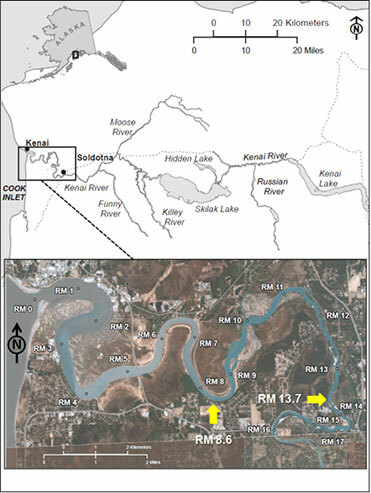 ADF&G selected the River Mile 14 site because it is located below most major king salmon spawning grounds, it has a nearly ideal bottom profile for sonar deployment, and it is narrow enough that nearly the entire cross-section of the river can be covered by sonar. Locating the site below most major spawning grounds ensures that most king salmon will pass the sonar site before they stop to spawn (telemetry studies estimate that approximately 95% of Chinook salmon spawn upriver of the River Mile 14 site). Selecting a site with a good river bottom profile in a section of river narrow enough so nearly the entire cross-section can be covered by sonar ensures that the majority of the fish passing the site will be detected by the sonar. 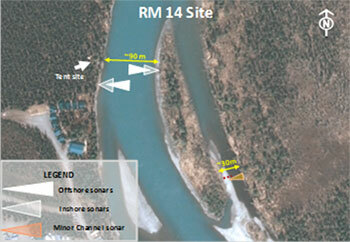 Aerial view of River Mile 14 sonar site showing sonar coverage on the main river channel and the minor channel. 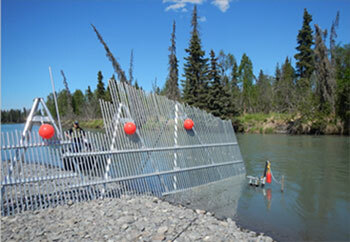 Photo of the sonar and fixed weir used to detect fish passing upriver in the minor channel. Photo of the sonar tent (on right) and buoy (on left) marking submerged sonar equipment. Photo taken near the east bank looking upstream showing a yellow warning sign used to warn boaters of submerged sonar equipment.